Running my first half marathon was the best experience of my life. Setting my mind to something and going after it was completely rewarding. If you're thinking about getting serious about long distance running, I highly recommend it. For me it was a great form of exercise, it got me outside (some days for 3 hours straight), and it was a way for me to clear my head - much cheaper than therapy! While I recommend investing in supportive shoes and epsom salts, I also recommend bringing some fuel with you on your longer runs. Generally any run longer than 90 minutes requires you to refuel, and if you're training for a half or full marathon, you will indeed hit that a least once a week. Above are some of my favourite "running candy" that helped me get through my longer runs. 1. Jelly Belly Sport Beans - These Jelly Belly's taste just like the candy you'd buy when your sweet tooth hits. I prefer the Lemon Lime flavour while running. The thing I like best about these is that I can easily grab one Jelly Belly while running and pop it in my mouth and within a few chews it will break down. The other thing that is great is that you can space them out every 5-10 minutes so that you do not get cramped up from too much sugar. They now come in a different "Extreme" version that has added caffeine to them as well. 2. Cliff Shot Bloks - These running candies are made by the same company that makes Cliff Bars. Similar to the Jelly Belly Sport Beans, they are like little candies you eat on the run. I usually wrap a few in plastic wrap and put them in my running belt, versus taking the whole package on a run. They are chewy and addicting, I could easily down the whole package in one sitting. But the key to refueling while running is avoiding cramps. Again I would recommend chewing on one Blok and waiting 10 minutes or so for your next one. Remember to always drink some water afterwards too. 3. GU Brew - This is a similar product like a sports drink. You mix the package in a pitcher of water before a run, and divide it between your running bottles (always leave at least 2 bottles for just water). This stuff tastes great (try the Lemon Lime, it's very refreshing) and provides energy and electrolytes on the go. If you are going with the Brew, you should not need the candy as well as it provides enough energy to get you through 2-3 hour runs, if you go for longer you may need more energy to refuel. 4. eDiscs - These are little tablets that dissolve in your mouth and offer 3 grams of carbohydrates and electrolytes similar to a sports drink. The discs taste great and are low in calories unlike many sports drinks. These are easy to eat while running and they dissolve nicely in your mouth. They are a great replacement for sports drinks, and are essential if running long distances or are out in the Sun too long. I usually wrap a few in plastic wrap and stick them in my running belt. These in combination with a some Jelly Bellies or Shot Bloks provide a great combination of energy and electrolytes. 5. eLoad Energy Gel - This gel pack is made by the same company as eDiscs. I personally wasn't a huge fan of the gel packs, but they do provide excellent energy when you need it most. 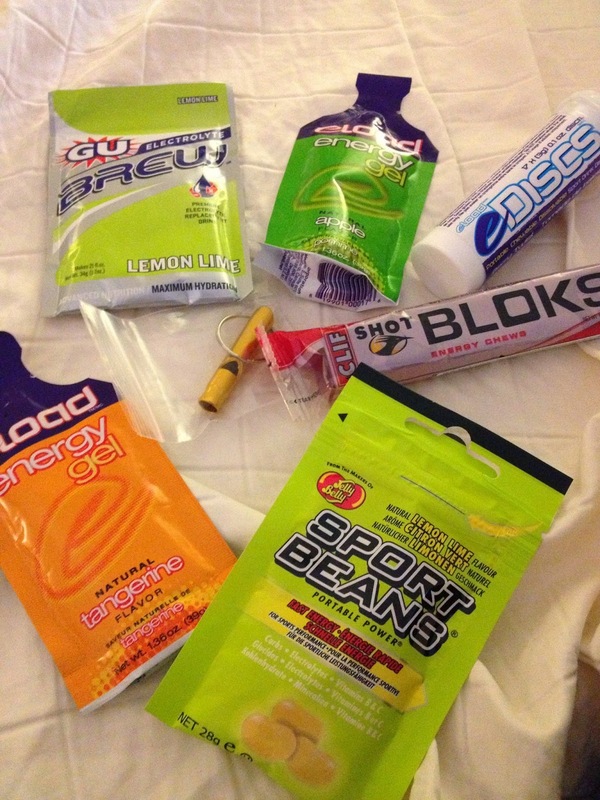 Many runners prefer gels to the candies because they can be easily slurped and swallowed while running. For me the consistency was a little off, almost like a cross between pudding and jello. I recommend trying gels and the candies to see which type you prefer. I also found the candies could be easily stored in my running belt, where as the gels didn't fit as nicely. Shown above in Tangerine and Lime. 6. Whistle - The whistle provides no nutritional benefit but it is a must while running, especially for those early morning runs. Its small enough that I can store it in my pocket, but provides some comfort to me in case of any trouble. 7. Running Belt - Not shown, but absolutely essential to any long distance runner. I recommend getting a belt with a least 4 bottles, but 6 bottles is preferred. Mine has 4 and on hot summer runs, I still need to run into coffee shops and refill my bottles mid run. My running belt is by Nike and has two great mini storage areas for my snacks! 8. Garmin Forerunner 10 - This is a runner's best friend. I highly recommend investing in a running watch if you are serious about running long distances. The Garmin Forerunner 10 is approximately $150 (Running Room) and worth every penny. This watch is easy to use and fast to connect to a signal once you get outside. You simply start the watch once you begin your run and it does the rest for you. It tracks your time, your distance, your calories burned, your pace, and everything else you could ever want. Once you get back from your run, simply connect the watch to your computer and it uploads all of your results to your personal web screen. This way you can track and monitor your progress, you can see your best and worst times and paces, and it will map out your route for you and keep it tracked for the next time.